In my former employment we achieved returns greater than out cost of capital, as that was why we were there. We only invested in things with substantially higher returns than the WACC, in order to generate profit. A company that matches its cost of capital is breaking even, not growing or profitable, so I would expect to see returns above the cost of capital otherwise somebody isn’t doing a very good job. Investments should have a positive NPV, surely ? ave no choice but to use their services anything they like? 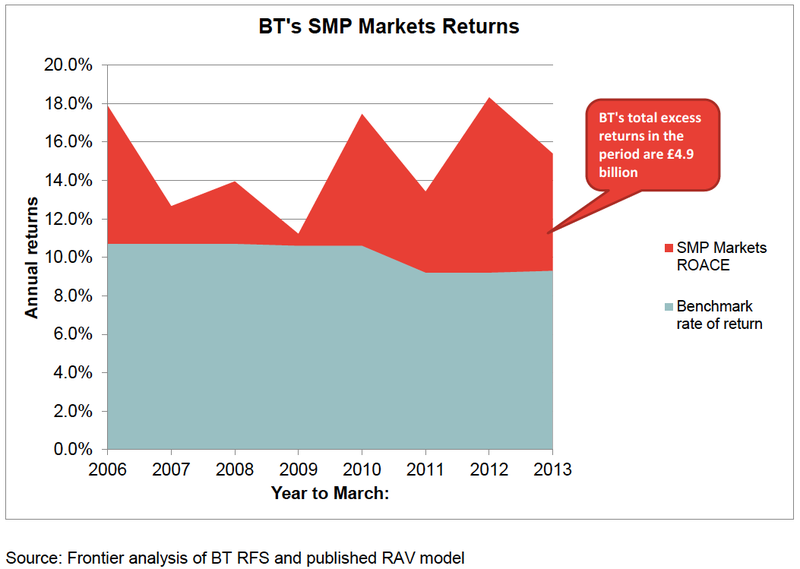 Frontier Economics looked only at those parts of the business where BT has SMP; where it doesn’t, i.e. there is competition, BT can charge what it likes. As we have seen, especially with Global Services, it isn’t very good at competing, so it uses its monopolies in Openreach to cover its losses in other parts of the business. In case you still think that’s good idea, I refer you to the Public Accounts committee statement on the four big private sector suppliers to government, with whom we spend £187bn a year. AS a reseller of WLR3 services and broadband services from Openreach via various wholesalers using Openreach’s WLR3 Portal, in my opinion, whilst the 10% overcharge is wrong it is no surprise and is a red herring in the scheme of things. Quite frankly I think we should be focusing on the value for money to users of their services and the poor service and workmanship. The lack of customer care and general inability to recognise customers can’t trade if their services are not fixed quickly and efficiently or (and again in my opinion) the anti-competitiveness of the whole service offerings from the incumbent monopoly needs to be focused on by all of us as I truly believe BT and Openreach think they are doing a great job! I would gladly continue to pay the 10% overcharge to Openreach if products and service processes worked for resellers and were installed in timeframes that were reasonable and engineers were allowed to fault find and complete tasks rather than ducking the work if they run out of allotted time for the job. If this meant Openreach employed and trained more staff using the 10% overcharge to do it, I would be a happier reseller of their services If it meant better service to me and my customers. I sell their services because I have to (I have to buy services currently from an ungrateful supplier who begrudges selling them to me!) given a choice I would like the ability to vote on their service to me and my customers with my feet but I can’t as there is no one else. So that’s a monopoly isn’t it? Supposedly, Openreach already works to Service Level Agreements that are stricter than anywhere in Europe. Quite frankly that does not stop them consistently giving poor service to Wholesalers, Retailers, Resellers, business customers and residential customers alike in effect treating them with contempt. All of which affects UK PLC from trading effectively. Expecting BT and Openreach to offer good service is also unlikely given the lack of any coherent escalation processes and anyone to call if you have problems your local Wholesaler can’t get resolved. I think at present Openreach pays lip service to customer complaints and hides behind OFCOM processes and the data protection act which in itself has never helped me resolve any issues we might have had with either BT or Openreach in the past. We strive to give our customers the best service we can and that can be blighted daily by having to wade through Openreach processes that are clearly designed to slow down the process of fixing faults or ordering services. BT and Openreach have a lot to answer to in my eyes, 10% overcharge? I am pretty sure that is just the tip of a very large iceberg! Many thanks for joining us Martin. Judging from the OTA2’s graphs of Openreach’s performance, many other CSPs will be feeling your pain too. The Office of the Telecommunications Adjudicator is the place to take your complaints about shoddy service, but frankly, as the graphs show Openreach’s performance has been below target for almost all of the past two years, one wonders what the point of it is. Phil T is quite right. A business which does not make a healthy margin above its cost of capital will not survive. Regulators should be convenred the price, quality of service and anti-comptitive behaviour – not “theoritical fictions” like cost of capital. That said, they way that the profits from BT’s monopoly operations appear to have cross-subsidised its losses in those markets where it does have to compete as well as to enter new markets (e.g. content) do appear to be indicative of regulatory failure. The lack of transparency regarding Central Government spend with major contractors compared to the requirements it is placing on Local Government is another, perhaps even more reprehensible, issue. The NAO’s report on government contractorsshould be required reading. Just because they concentrate on the activities of G4S, Serco, Atos, and Capita doesn’t mean that BT, a major contractor to government, is absolved of its criticism. It’s as much an indictment of civil servants ‘not being on top of things’ as it is of ‘contractors not appearing to treat the public sector fairly’*. *You could use the BDUK procurement as a case study for what the NAO says is wrong with public procurements.. Surely the question is as always: cui bono? Who benefits but the shareholders? Who are they then in our world of ‘too big to fail’ and ‘when corporations rule the world’?